2 bedroom 6 berth 12 x 36ft Willerby Westmoreland. LOUNGE Open plan lounge with fixed seating and gas fire. Flat screen TV with Freeview and DVD player. Pull out bed is fitted for those additional guests. KITCHEN Equipped with necessary standard utensils, microwave, fridge with freezer compartment, gas oven and grill. BEDROOMS Double room with fitted wardrobes, and access to main family bathroom and room for a travel cot. Twin room with 2 single beds and fitted wardrobe. HEATING Single glazed with integral fan blowers fitted in the bedrooms. Gas fire fitted in the lounge. VERANDA NO, has a side grassy area. 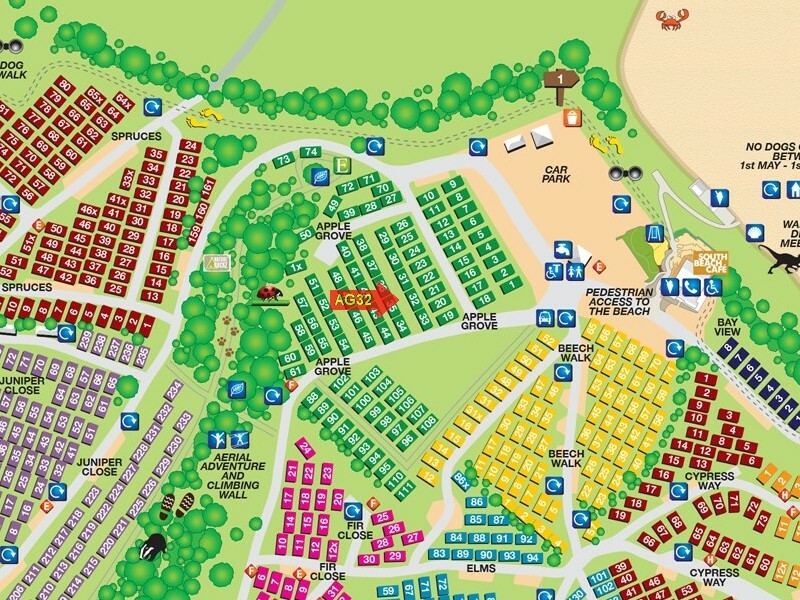 NEAREST CARAVANS FOR GROUP BOOKINGS; To find the closest caravans for group bookings please click Browse Caravans at Devon Cliffs, then select Apple Grove (AG) from the Park Area list and click Search.